In this episode Alcycia interviews Kerry Damiano. Kerry Damiano is a former Miss Idaho USA. She is the owner of Dazzling Performance, the Executive Producer, Creator, and Host of The StyleFyle. Recently she launched her own women’s clothing and jewelry line. 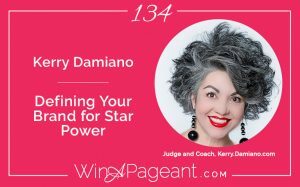 She has been involved in pageantry since 1981 in all three capacities of judge, titleholder and contestant, and as a current Pageant Coach and Wardrobe Consultant, she trains young women in fashion, modeling, interview and public speaking. Kerry is also an accomplished Pianist, a Motivational Speaker to women’s organizations and youth groups, and has a Scripture memorization ministry called The Amazing Word. In her spare time, she loves to travel, having been to over 100 countries. Join us at the Beauty|Brand|Believe Expo on March 10th in Washington!